This year for the first time I had the pleasure of attending NERGC. Like Friday (Day 2), Saturday (Day 3) consisted of 5 lecture slots, starting at 8:30. I chose to begin my day with “Getting Ink on Paper: Publishing Your Genealogical Material in a Digital Age,” the other lecture Craig Scott gave at NERGC this year. [See my NERGC Day 2 post for some information on his French and Indian War lecture.] For those that don’t know, in addition to being a military records expert, Craig Scott runs Heritage Books, one of the major American reprint publishers. I was a writer and editor before I became a genealogist, and have attended several things on this subject, the most noteworthy being the 2011 session of Boston University (BU) Center for Professional Education’s course, “Writing Family History Narratives and Other Genealogical Works,” taught by Dr. John Colletta and Dr. Thomas Jones, and a one-day seminar on writing and publishing held by New England Historic Genealogical Society in 2010. However, unlike Craig Scott’s French and Indian War lecture, I did not circle this as one of my few must-attends as soon as I registered; the most compelling reason I decided to attend it was because he had been such a good speaker at his other lecture. My friend who went with me to this lecture has (as far as I am aware) never attended anything formal to do with writing, editing, or publishing genealogical works and for them, Craig Scott being such a good speaker seemed to be the only reason they decided to go with me. Continuing from the previous day, we reserved our seats early to ensure we would have spots in the lecture. We knew from the previous day that Craig Scott opens the room to questions on any subject 15 minutes before his lectures officially begin, so though we left to walk around a bit, I suggested we return when I noticed it was less than 15 minutes before 8:30. Indeed, when we returned he was taking questions from the small number of people who were already seated, scattered around the largest room. He spent the longest time on a question about a birth certificate that the questioner reported has a father listed but not a mother. Upon Craig Scott’s questioning of the question-asker, this was ascertained: A child was dropped off at a state home at about 6 weeks old, and the birth certificate for the child lists the person who dropped the child off at the home as the father, but no mother is listed. Craig Scott asserted that the home, which the question-asker said was run by the state of Vermont, had filed a belated birth certificate to have all the paperwork in order. He also noted that while the birth certificate lists the man who dropped the baby off as the father, just because the man dropped the baby off, that’s not proof that he actually was the father, regardless of the birth certificate’s claim. After the pre-lecture Q&A, Craig Scott began the scheduled lecture. In a lot of ways, this lecture complemented the genealogical writing course I took at BU, which I think is rather impressive given that that was an intensive one-week all-day course and this was one hour. Craig Scott recommended the same books as had been required in the writing course – Evidence Explained (and Evidence! if possible), Producing a Quality Family History, and Numbering Your Genealogy. He also recommended the unfortunately out-of-print Indexing Family Histories: Simple Steps for a Quality Product, which he said consequently sells for ridiculous sums online. Craig Scott made a lot of succinct comments that I thought were noteworthy. For example, he said, “Quality research is, in my mind, defined as ‘when people read it, they agree with you,'” and if they don’t, you have to define who it is that agrees with you – are other researchers producing quality work the ones that agree with you? Another thing he said really stuck with me: “If you’re not willing to accept scrutiny, you’re not ready yet.” I know a lot of genealogists whom I’m as sure as I can be would produce quality work if they did produce work, but aren’t doing so yet. But maybe my favorite was, “Do you know how I spell a genealogy that has no citations? C-R-A-P.” – a quip which got a lot of laughs and knowing nods from the audience. He summed up the genealogical writer’s dilemma: Too few citations and it’s fiction; too many citations and it’s boring to most readers. Do your best to strike the balance between history and your family – to put people in a place. More Craig Scott quotes: “Tell the story of your ancestors, not just their vital records.” “A book of family group sheets does not tell a story.” The more scandal and/or secrets about dead people, the more compelling the read. Craig Scott told a story about when he was a young genealogist starting out and found out via his research a secret about his grandmother’s family, and when he asked her about it, she said (approximately), “I’ve been waiting for someone to ask,” and gave him the details in exchange for the promise that he would wait to share them until after she died. Include as many pertinent maps, photos, and other illustrations as you can afford – and Craig Scott did stress the pertinent part. In his opinion, if there’s an illustration, it had better somehow relate to the story of the family, and you had better establish a clear relationship between any artwork and the person(s) to whom it relates. If an illustration does not help to tell the story, it’s irrelevant and should simply be left out. Craig Scott went on to talk about the nitty-gritty of publishing: Marketing, book construction, publishers and printers, the market, and things like pricing. I will hit a few of the highlights here. Craig Scott stated that part of the market is people who have helped you put the book together (always collect names and addresses from them). A couple more comments: “Do you know when a book is most in demand? Immediately after it’s gone out of print.” “If their name is in the book, they might buy two copies – one for them and one for their local library.” (I can attest to having done this last one with books that mention an area and/or families I am researching.) He suggested putting out a newsletter for such reasons as helping get buzz out for the book, collecting more information and illustrations for it, and generating new content. He said to keep in mind that roughly a third of people who say they will buy a book actually do. He suggested that every author give a pre-publication offer, announced about two months before the book is ready to be sent to the printer, which also is a month after the three-month time window that he suggests setting aside a book between writing it and sending it off. As he phrased it, “What I do when I prepare a book is prepare it and let it sit for three months.” (So you are setting the book aside, already finished but not yet published, and then one month after you set it aside, you begin offering a pre-order deal.) He suggests providing a discount of about 20% for pre-payment, and to be sure to provide a date when the pre-publication deal ends, which he suggests be about 30-60 days after the publication date. Don’t do any postage-paid orders; keep shipping separate. Also keep in mind that in some states in the U. S., shipping is taxable. Craig Scott stressed that in this digital age, you have to print a copy of the book at least once to have copyright in the U. S.
Next up, I attended “Family History Resources in the Vermont State Archives” by Vermont State Archives Senior Archivist Scott Reilly. A number of NERGC’s lectures were sponsored by societies that co-sponsored NERGC, and this was the lecture sponsored by the Genealogical Society of Vermont. I had already had the pleasure of emailing with Scott Reilly several times, and he happened to be standing outside the room waiting for the previous lecture’s attendees to trickle out when I arrived, so I introduced myself and said that I didn’t know if he would remember me from our emails, and he sounded a bit surprised as he said that actually, he did remember me. I also noted that the volunteers with whom I’d chatted at the Genealogical Society of Vermont’s booth were in attendance at the lecture. I had pretty high expectations for this lecture, and it exceeded them all. The holdings of the Vermont State Archives consist almost exclusively of public records, from circa 1760 to the present. There are very few personal papers or similar items. As in most locales, some public records in Vermont are ‘exempt’ from public inspection; in Vermont all exempt records are closed forever except adoption records, which are closed for 99 years. Scott Reilly mentioned at the end of his talk that one of the future plans of the Archives staff is to propose a ‘sunset law’ to the legislature, allowing more exempt public records to become open to the public after a certain amount of time. In 1919 town clerks were required to transcribe all BMD records in the possession of the town and the churches, as well as inscriptions on gravestones in the town cemetery(ies), for all individuals who died prior to 1870; in Scott Reilly’s experience, some town clerks were more diligent about doing this than others. Scott Reilly explained that any card that has a cemetery listed lists a vital record that was transcribed from a gravestone, which I’d not realized before; this means that one of my ancestors had a standing gravestone a century ago, though a FindAGrave volunteer was unable to find an extant stone for me last year. My suspicion now – though he was not explicit on this part – is that for the other events where there are two cards, there were two sources in the town and the clerk copied them both; if so, this would explain why I have found the two cards to sometimes conflict or one of the two cards to have more information listed than the other. The original cards are at the Vermont State Archives. There is an original card index covering c1760-2006. The bound annual returns submitted to the state cover 1857 to 1908. The Vermont BMDs are believed to be “substantially complete” post-1908; if you can’t find the event, it probably didn’t happen in Vermont and you should probably start looking in other states for it. But before 1908, you may simply have to start looking elsewhere in the state for the record. As regular researchers of Vermont may already be aware, Ancestry has Vermont BMDs from 1909 to 2008, and FamilySearch has the BMD card index from 1760 to 2003. So far, no post-1954 BMD cards have been indexed on FamilySearch, though you can browse them by image. Scott Reilly said, “If it [a vital record] wasn’t recorded in the town, it most likely wasn’t recorded.” FamilySearch has digitized some of the town record films, but has not indexed them yet; so again, you can browse the record set by image online. Scott Reilly recommended calling a court to get advice on locating a specific case. Prior to 2011, there were as many as 19 probate districts in Vermont, with several counties being covered by two districts. Now, each district covers one county. The Vermont State Archives holds microfilm copies of probate record books for every district up to 1850. They also hold up to at least 1945 for: Fair Haven (Rutland County), Windsor (half of Windsor County), Marlboro & Westminster (each covering half of Windham County), and Franklin (Franklin County). The Vermont State Archives also holds naturalization records. Vermont State Prison: Registers and “description books,” from 1809 to 1975, are available to the public for research. They typically contain biographical information and information about the nature of the crime and the sentence. Vermont State Hospital: The Vermont State Hospital suffered extensive damage from Hurricane Irene, and recently transferred their archives to the Vermont State Archives. Again, the registers are open to the public; they provide basic information on patients admitted to this Waterbury hospital between 1891 and 1969. Register information generally includes name, age, residence, date(s) of admission, and whether the individual was admitted by the state or was a “private patient.” State law permits disclosure of some patient information to “family members.” What this means is not well-defined by the law, so the Archives staff interprets it to mean relatives. The Vermont State Archives also holds the Eugenics Survey of Vermont (1925-36). Because this was a privately funded organization, organized and directed by Henry F. Perkins, a professor of zoology at the University of Vermont, these records are not ‘exempt’ records like most medical-focused records. Included in these records are extensive pedigrees of many of the families that were targeted by the Survey. There are indexes to lists of informants at the Archives. The Vermont State Archives also has military records, the Manuscript Vermont State Papers, and annual returns of divorces. Surviving military records are most complete from the Civil War onwards. Mary Greene Nye, the Editor of State Papers from 1927 to 1950, created a name and subject index to the papers, much to my endless delight. The Nye Index from 1760 to 1800 is available as a database on the Vermont State Archives website. Nye’s index goes to c1860, but the 19th century index is only available on-site at the Vermont State Archives to date. The Nye Index is a tremendous help; I really can’t even stress how much. For example, it’s greatly helped me in locating the Treasury Records for my Vermont American Revolution research that I mentioned in my NERGC Day 2 post. The Vermont State Archives recently got a two-year grant from the grant wing of NARA (known as NHPRC) to do a County Court Records Project, digitizing three counties – Caledonia, Lamoille, and Orleans – from c1780 to 1945. They are about two-thirds done with the digitizing project at present, though there has not been any indexing yet. Scott Reilly and his fellow staff members hope this will serve as a model to digitize the other counties’ court records. There is more available on their website – both databases and information – than what I have covered here. I strongly suggest anyone with Vermont roots check it out. I thought this talk was so fantastic that not only did I give it high marks on the surveys we filled out at the end of every talk, but I mentioned it specifically in my general post-NERGC survey in response to the question about whether attendees felt that talks at NERGC 2013 had given them ideas for resources about which they had not previously known at New England repositories as an excellent example of a talk that did this. If you ever get the chance to hear it, I can’t recommend it highly enough. 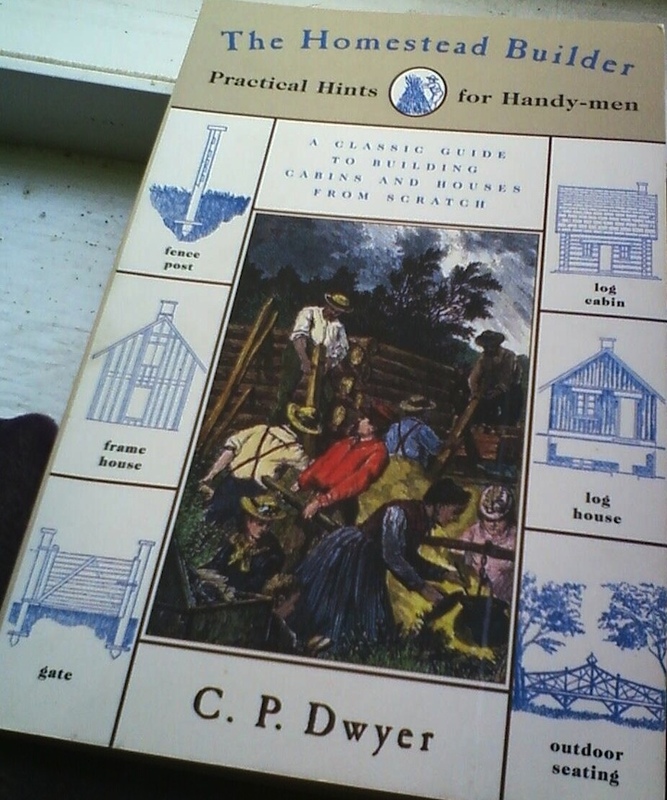 A book I purchased at NERGC: The Homestead Builder: Practical Hints for Handy-men by C. P. Dwyer. This is a reprint of Dwyer’s 1872 book, with a modern introduction. The book shown above, The Homestead Builder: Practical Hints for Handy-men by C. P. Dwyer, was a how-to book for someone looking to build a homestead and its accoutrements, such as fencing. As the longest-time readers of my blog know, some of my family homesteaded in North America. The line with whom I started in genealogy came from Scotland to the Upper Plains of the U. S. in 1880 to homestead. The modern introduction of this reprinted 1872 book mentions that the book was available for sale in Europe as well as in the U. S. and Canada. While I cannot say for sure whether my Scottish emigres read the book before they left their old homeland for their new one, I find it interesting to know that it is a possibility. As for people, it’s so difficult to describe what it’s like to be at a genealogy conference unless you’re actually there and also experiencing it. I already knew a good number of people at NERGC in person from the classes and events I have attended, the local group I run, the repositories I visit, and a variety of other means. I am used to strangers striking up conversations at genealogy and history events, but I discovered two things at the conference: First, a number of people I had not yet met in person recognized me from my online profile photos [hi, Twitter friends who were at NERGC! ]; and second, since my name – Liz Loveland – is fairly unusual, a number of people I had not met in person recognized my name on my name tag from things like mailing lists. After the first day, I got used to people peering at my name tag before talking to me, and to people coming up to me expectantly when I did not yet know who they were. By the third day, I had gotten used to intending to do something – say, look through the vendor hall or take a walk to stretch my legs – and instead end up spending almost all of my time talking with people; even if a hallway, room, etc., was fairly empty, there was a good chance there would be people I knew nearby. It is pretty amazing, in retrospect, how many people I talked with at the conference – including strangers who struck up conversations. After the lunch break, three lecture slots were scheduled for this last afternoon of NERGC. One of the people with whom I’d had lunch had attended a previous version of one of the first afternoon lectures, “Weaving Together New York’s Metro Area” by Linda McMenihan, PhD, and Jill Martin, JD, and recommended it when I said at lunch that I was considering attending it, so I decided to go to it. It was held in the same small room where the Vermont State Archives lecture had been; awkwardly placed up a small flight of stairs topped by a large landing near the hotel’s front desk, I don’t know how I would have found it if we hadn’t had the BU reception there on Friday evening and, after the conference’s hospitality desk hadn’t been able to answer my question as to where the named room holding the reception was, several of us had peered at the map until one of us had finally located it. I had to point the room out to a couple other attendees on Saturday, and wouldn’t be surprised at all if some people had intended to go to lectures held in that room but been unable to find it and simply given up. As people came in, McMenihan and Martin passed out a double-sided handout literally full of URLs, explaining that they had compiled their syllabus submission several months ago and had waited to print the website handout that week to verify that the URLs were up-to-date. To me this was a good sign, as it showed that they were cognizant of a possible issue with a syllabus and thus probably experienced at speaking. So often I have returned home from an event excited to check out a particular webpage, only to discover upon typing it in that the URL had become invalid between the time the resource was compiled and the time it made it into my hands. Each lecture at NERGC was introduced by a volunteer, whose styles varied from literally reading aloud from the sheet of recommended introduction points to simply saying something like, “I’m sure you’ve heard this all before, so let me just turn it over to the speaker.” For this one, we had the most comical one I heard at NERGC, who started out with asking who had been at the lecture where in his introduction he’d said that anyone who left their cellphone on during the lecture should be pointed at and called a fool. Several people raised their hands and chuckled, and I would soon discover why, as our introduction volunteer explained that the cellphone of that speaker, Steve Morse, had gone off twice during that talk, and consequently he didn’t want to phrase the cellphone comment the same way again. He went on to ask a number of obscure trivia questions about New York City, and at least one person in the audience knew every one well enough to quickly answer. “What are you all doing here then?” he finally (approximately) asked jovially, and then turned the floor over to McMenihan and Martin. McMenihan and Martin started out by noting that New York City has been called the “fifty-first state” for research by some American researchers. They split their talk in half, each doing part of it. 1899 is the “watershed” year for New York City, when it became the five-part city we still know today. In 1899, there was a major centralization of records; most records created in the boroughs prior to consolidation were collected and taken to Manhattan to be held as New York City records. However, there are some “Brooklyn remnants,” as they put it: Brooklyn still has a separate library system and the Brooklyn Historical Society, originally named the Long Island Historical Society, is separate and contains a treasure trove for researchers of the area. New since my aforementioned lunch companion had attended this talk at a previous conference, McMenihan and Martin had added three of the surrounding counties – Westchester, Suffolk, and Nassau. Westchester County was home to some of the early Dutch colonists, and originally used the Dutch manor system in its land records. Suffolk County was an original county and primarily consisted of New England founders. Nassau County was formed in 1898 from Queens. They stressed that they had added information on these counties to their talk because there was a lot of migration between them and the five boroughs. Many of the urban towns and cities began records as early as the 1850’s and 1860’s. (Clarification for New England researchers: Yes, for New York state, that is early.) As researchers of New York City are likely already aware, the older New York City records are held by the Municipal Archives. Recent/current marriages are at the City Clerk’s office. The New York City Municipal Archives does not allow photographing on-site. They recommended searching the New York City vital record indexes on both ItalianGen and GermanGen simultaneously through Stephen Morse’s One-Stop Genealogy Site. There is a contract with Ancestry to put the New York State Index online. The counties surrounding New York City are part of the state vital records system, like the rest of the counties in New York state beyond the five boroughs that comprise New York City. The index should be going “live” later this year. It will be on Archives.com, one of the multitude of companies which Ancestry has bought. Prospect Cemetery in Queens was a colonial cemetery and there are transcriptions online. Woodlawn Cemetery in the Bronx was another major cemetery but there is nothing online for it to date as far as the speakers were aware. New York City’s “Potter’s Field” (Hart Island) database quite recently went live; records from 1977 forward are searchable. Probate record highlights: Kings County (Brooklyn) estate files from 1866 to 1923 are on FamilySearch. Brooklyn Genealogy Info GenWeb, a site they mentioned several times during their talk, transcribed early New York City wills. Westchester County’s website has some indexes/etc., and Suffolk County’s site has some for the early period. They said that in New York City property records, you can often search by address, finding information on the home even if the family did not own it. During the periods of 1939-1941 and 1983-1988, New York City photographed every building for tax assessment purposes. My companion at this lecture and another person in the crowd knew that the latter ones had been put online, and mentioned so in the questions and comments period at the end of the talk. According to my companion, the indexing on these is a bit “funky” and you may have to try multiple search tactics, including possibly searching for another building on the block to find the one of interest. I do not know what the URL is for this photographic set. The website PropertyShark.com is a commercial site that covers all counties in New York state; you need to register to be able to use it, but using it is free once you do. In answer to a couple of questions at the end, they provided these additional tidbits: Body transport records are extant and open for Manhattan from approximately the 1850’s to the late 1880’s, for both those bodies transported into and out of Manhattan. However, the body transport records are not even indexed, much less digitized. The New York Public Library has lots of old New York City area maps; some are online on their site, and some are only accessible on-site. At this lecture, my aforementioned companion was someone who has a ton of New-York-City-area research and probably could have given the lecture, but said later that they had thought it was excellent, which I thought also spoke highly of McMenihan and Martin. In my summary of it, I have mostly provided information that I thought would be of general interest and have excluded a number of things I already knew quite well, partially because I did not take notes on the latter. Some of these resources that I didn’t mention are included in my blog’s “Resources (Free)” sidebar, with the ones they most emphasized in the talk being the Brooklyn Daily Eagle Online and Old Fulton Post Cards, both of which are excellent newspaper sites. Next up, I moved from one of the smallest rooms back to the largest room for “Researching a Community,” the second lecture I attended by David Allen Lambert, this one sponsored by NERGC co-sponsor New England Historic Genealogical Society. Quite the opposite of David Lambert’s lecture that I’d attended in a tiny room that Thursday (Day 1), the largest room was crowded with people to hear this lecture that had gotten rave reviews from folks who had attended it at RootsTech 2013. I spotted a good number of people I knew scattered around the large crowd, but I was happy with my seat close to the front and none of them chose to come sit with me. After three days of interacting nearly non-stop with other people, I readily admit I rather enjoyed sitting alone there, and chatted a bit with a few strangers sitting near me while waiting for the lecture to begin. David Lambert discussed building an online community archive about a location where you live (or perhaps for one of your ancestral locations), using his own work building an online community archive for Stoughton, Massachusetts, for many of his examples. The basic idea is to utilize your genealogical research skills to create a site that will help researchers of a location where you live – wherever these researchers may be and regardless of whether you have any personal research where you live. It’s kind of like taking “doing more photos for FindAGrave than just requests” to a much broader level – and indeed, David Lambert mentioned that he had photographed all of Stoughton’s extant gravestones, put the photos on FindAGrave, and linked to them from the website he had built. I did not take any notes at this session. Some of David Lambert’s suggestions: Check to see whether someone else has already started a project like this before you begin (don’t reinvent the wheel). Check to see what’s already been put online in disparate locations, and determine whether it’s done in a way you find useful, in which case you should consider simply linking to the item on the other site from yours, or whether there’s something about it that makes you feel it would be worth the effort for you to do it over for your site (e.g., poor quality scans or the information is organized in a way that doesn’t make much sense to you). Get to know your town clerk (in New England) or equivalent staff member elsewhere; if you find your town clerk to not be amenable to your project, try to figure out someone else “over their head” in the town government to whom you can pitch your project. Work with local historical societies, churches and other religions’ institutions, civic groups, schools, etc. See what projects got funded and/or got volunteers but never went anywhere and see if you can get permission to put them online; a couple of specific examples he gave were old cassettes sitting at the town high school from an oral interview project past students had gotten funding to do, and a church that has already scanned their records but not done anything with them beyond putting them on the church’s computer. Repeatedly throughout the lecture David Lambert stressed the importance of being a sensitive content curator. If records are about people in the 1800’s or earlier, he advocated absolutely putting them online regardless of what secrets or scandals they might reveal. But if records are about people in the 1900’s and may contain information that the person does not know – say, a person in their 80’s may not realize they were adopted or ‘illegitimate,’ things which can plausibly be found in public records in Massachusetts (though in many states they probably would not be found in public records) – carefully weigh being kind against putting information that you found in the public domain online. I found this lecture really inspiring and would recommend it to anyone who is considering a similar project. One of the towns in my area doesn’t have an active historical society and has no centralized online community archive presence (as far as I am aware) and hearing this lecture rekindled my long-time desire to do something about that. There are a few people with whom I want to check first to make sure that I’m not starting a project someone else is already trying to build, so far doing it out of sight. My last choice for NERGC was difficult for me, with my top two choices being “The Symbolism on New England Gravestones: 17th Century to Present” and “Exploring Your Pioneer Valley Heritage.” I am very interested in gravestones and the history of their symbolism and of graveyards, and spend a lot of time in graveyards; and I have a good amount of research in the “Pioneer Valley,” which is the name by which a large swath of Western Massachusetts is known here in New England, though my biggest reason for considering the latter talk was that one of the allied families in the case study, according to the description and the syllabus, was the Sheldon family, which I am also researching. In the end I chose to go to “The Symbolism on New England Gravestones” by Donna Walcovy, PhD, who used to be a professor and is now a professional gravestone restorer. She is also a friend of my Twitter friend and gravestone blogger Midge Frazel (@midgefrazel) of the blog Granite in My Blood, and Midge had introduced us that Thursday (Day 1). Many people have sympathized with my descriptions and/or photos of what I consider to be the deplorable state of the Old Burial Ground in Arlington (formerly Menotomy), Massachusetts, but when I met Donna and mentioned a bit about it, she was the first person to ever provide a concrete suggestion for something I could try. I don’t know whether it will work, as it will depend on whether Arlington is participating in something particular, but at least it’s a step I can take. Donna was an extremely entertaining speaker, though as someone who has spent the last several years visiting cemeteries in my area of New England, with a concentration on the older ones, I turned out not learn much I did not already know. Donna said that she had included more of a variety of information in the syllabus than she was including in her talk because she didn’t have good enough photos for slides for some of the syllabus material and had prioritized including material in her talk for which she had good photos. I subsequently learned that two of the other people I know who have a lot of research in the Pioneer Valley did go to the other talk, and said they left it feeling confused about how the different families in the talk were connected to each other, so I’m glad I chose the talk that was entertaining. I had considered asking my ride home that day if we could stop in the vendor hall before leaving, but when we left the last lecture, which was in one of the small rooms by the vendor hall, we discovered that the vendors had already taken down their booths and the hall was empty except for some scattered tables and dividers. So we simply headed home from NERGC, running into a few people we knew on the way to the car. It was strange to suddenly be done after three days of “rush, rush, rush” and “learn, learn, learn” and “people, people, people.” As a somber reminder of the area events of that week, as we got close to metro Boston on the highway, we saw a good number of police cars evenly spaced along the highway’s shoulder on the other side of the highway, all sitting silently with their lights flashing, their cars marking them as from a variety of different towns in the area. I would later learn that the MIT officer’s funeral was that day and that they had been there in solidarity. When we had been driving back the previous night, the highway signs on our side of the highway had warned motorists to check local media for the current situation in metro Boston. That evening, as we drove past the silent police cars towards the city, the highway signs thanked passing cars for the support shown to Boston.